Some people struggle to really admit when they are struggling, while others are willing to admit it and even ask for help. 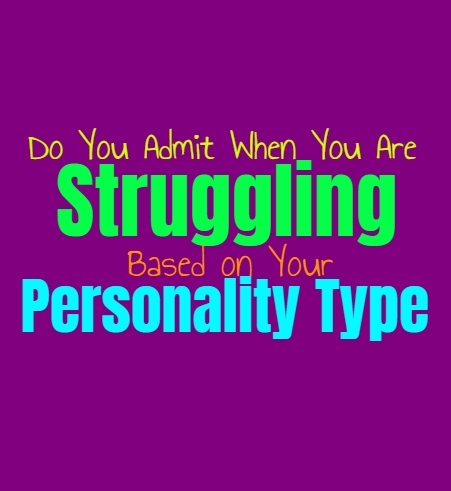 Here is how easily you can admit when you are struggling, based on your personality type. INFJs do sometimes have a hard time admitting when they are struggling, unless it is to someone they trust. When the INFJ is close to someone and sincerely trusts them, they want to be able to share that they are struggling and hope for some helpful advice and support. When they are around people they feel will judge them, the INFJ will have a harder time really admitting when they are struggling with something, and will likely want to keep this to themselves. ENFJs often want to appear perfect, even around the people they love and care for most. This can make it challenging for them to really admit when they are struggling, since they don’t want to seem incapable of weak. Their desire to seem strong and nearly perfect, makes the ENFJ fearful of how people will respond if they recognize that the ENFJ is really struggling with something. Because of this they rarely admit when they are experiencing their own struggles, and will keep these things to themselves. INFPs don’t mind admitting when they are sincerely struggling, especially if they need or even help. They don’t find it natural to hide their feelings or experiences, and are more comfortable being honest about who they are and how their are feeling. When the INFP is truly struggling they want to be able to share this with someone, and hope that it can help them move forward and overcome these struggles. INFPs just need to vent sometimes and express that they are having a hard time, and this helps more than anything else. ENFPs might have a hard time really admitting when they are struggling, since they don’t want to appear incapable. While they do sometimes feel the need to be open about their feelings, there are certain instances where it is not something they feel comfortable with. If the ENFP wants to seem like they are strong and capable of doing something, they don’t want to admit that they are struggling with it. They can hide this more when they are around someone they really want to be impressed by them. INTJs usually find it challenging to really admit when they are struggling, especially to others. They prefer to focus on improving themselves and rarely see a necessary reason for them to be open about their struggles. INTJs are much more internal when it comes to their feelings and don’t feel comfortable sharing them with others. If they are having a hard time with something they often search themselves for a solution, and don’t want to be all that transparent about what they are experiencing. ENTJs are perfectionists and so they often have a hard time admitting when they are struggling with anything. They don’t want people to realize when they are having a hard time, instead they try to just overcome this. ENTJs can bury their feelings and this can make it difficult for them to share that they are struggling or even that they need help with something. They want to be able to find a solution themselves, and don’t find it easy to turn to others and lean on people when they are having a hard time. INTPs rarely admit when they are struggling, unless it is with someone they deeply trust. When they do trust someone they might want to express their problems to them, in hopes of being able to feel understood. INTPs don’t always want someone who can solve the problems, but they do enjoy having support and realizing that they aren’t the only ones struggling. It can be hard for them to really express themselves though, and so sharing that they are struggling can be draining for them. ENTPs don’t really like to take time to admit when they are struggling, instead they just want to keep moving forward. When they are having a hard time with something it can actually be even more difficult for them to admit this. They might feel the need to express their struggles to someone they trust though, especially if they feel like they need advice and support to get through or overcome it. ENTPs do have a hard time expressing themselves though, and so they often bury their feelings. ISTJs have a tendency to push through even when they are struggling and don’t find it easy to turn to others. They are independent people who almost always deal with their problems on their own, rarely turning to others for help. When the ISTJ feels like they are struggling they keep this to themselves most of the time and simply search for a way to overcome. For the ISTJ it can feel like a weakness to admit when they are struggling, and so they rarely enjoy opening up about it. ESTJs don’t like admitting when they are struggling, instead they often try to deal with it themselves. They don’t easily turn to others for help, since they want to seem capable of competent. For the ESTJ it can feel like weakness if they cannot seem to overcome their struggles and find a solution to their problems. When they are having a hard time they just want to push through it most of the time and find it challenging to really express this to someone else. ISFJs do often try to overcome their struggles and might not want to burden others with them. For the ISFJ it often feels like they are bothering their loved ones when they express their own struggles or challenges. So they usually keep these feelings inside and simply try and push through them. When they are struggling the ISFJ can feel like they are failing and they really don’t want to let down the people they care for. ESFJs don’t find it easy to really express when they are struggling or having a difficult time. They often bury these feelings since they really don’t want to burden others with them. Most of the time ESFJs feel like they need to overcome their struggles themselves and so they rarely turn to others or open up about what they are dealing with. This comes from a desire to seem capable dna strong, and to avoid disappointing the ones they love. ISTPs don’t often feel comfortable being open about their feelings and so they don’t often admit when they are struggling. ISTPs can also be very independent people and so they usually try and figure out a way to solve their problems themselves. If they are truly struggling they might turn to someone who can help, but for a while the ISTP will try to problem solve without really needing assistance from someone else. ESTPs don’t mind admitting that they are struggling, especially to the people they trust. When the ESTP cares for someone and lets them into their lives, they want to be able to vent to them. When they are having a hard time the ESTP wants someone they can turn to for support and sometimes just to find ways to overcome the problem. ESTPs do sometimes want to appear strong in front of certain people, but they also want someone who they open up to when they are struggling. ISFPs aren’t really good at burying their feelings, especially around someone they love and are close to. When they are truly struggling the ISFP wants to be able to open up about this and really let their feelings out. They don’t find it easy to just keep these things to themselves, and really need to be able to express themselves. When ISFPs are struggling they want someone to be there for them, to show support and help them through. When ESFPs are really struggling with something they need to have people they can turn to. They aren’t good at burying their feelings and prefer to express them openly and honestly. For the ESFP keeping things inside and pretending they are fine, is not natural. They need to be able to express that they are struggling and hopefully have someone who can show their love and support to the ESFP. This sense of support helps them get through their struggles more than anything else, and so this is why they need to be open about.